Did you know that there are over one thousand varieties of peppers? However, peppers belong to a family called the “capsicum” family which is the botanical name for all peppers. Like their relatives, the chili peppers, bell peppers originated in South America with seeds of a wild variety dating back to 5000 BC. Like many other foods native to this region, sweet peppers were carried throughout the world by the Spanish and Portuguese explorers who traveled through the continent. Peppers contain lycopene which helps to prevent various forms of cancer. They contain carotenes which can help to prevent damage to cells that can lead to premature aging and they are loaded with Vitamin C which is important to the formation of healthy gums. Look for peppers that are glossy with tight skins and vivid colours. They should be firm to the touch with no soft spots and the stems should be green and fresh looking. Peppers should be heavy for their size and firm enough so that they will gently yield to slight pressure. Avoid those that have signs of decay including injuries to the skin or water-soaked areas. The shape of the pepper does not affect the quality, although it may result in excessive waste or not be suitable to certain recipe preparations. Peppers are available throughout the year but are usually in greater abundance during the summer months. 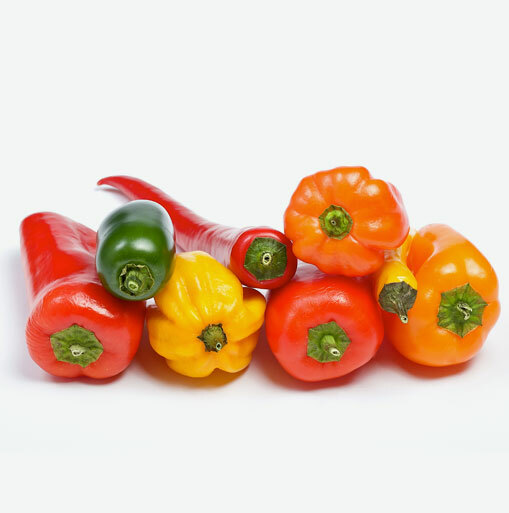 Peppers are best refrigerated unwashed in the crisper drawer up to 4 days. When you go to purchase your peck of peppers, keep in mind that they can be eaten raw, baked, stir-fried, or cooked into many tasty dishes. Use peppers in a low-fat dip or salsa. Grilled peppers make a great addition to fish, chicken, beef or tofu. Before coring and/or cutting the pepper, wash it under running water. If the pepper has been waxed, you should also scrub it well. Peppers can be cut into various shapes and sizes. To easily chop, dice or cut the peppers into strips, first cut the pepper in half lengthwise, clean out the core and seeds, and then, after placing the skin side down on the cutting surface, cut into the desired size and shape. Peppers can also be cut horizontally into rings or left whole for stuffed peppers after carefully removing the seeds from the inner cavity.